Did you know that Apple spends far less on R&D than any of its rivals – a paltry 2% of revenues, versus 14% for Google and Microsoft? This sentence tells us nothing meaningful, yet it’s crafted to make us think of Apple as a bunch of stingy bastards who spend virtually nothing on research and development; and to support the argument that they aren’t innovative. The misleading use of percentages annoys me. So, knowing that Apple have massive revenues, I went to NASDAQ to find out what that 2% meant. For the last full fiscal year (2011) Apple had revenues of $108.2bn, which means they spent $2.164bn on R&D; a ‘paltry’ sum indeed. Next I checked out Google’s revenues for the 2011 fiscal year: $37.9bn; meaning that 14% of their revenue is worth $5.3bn. Finally, Microsoft with revenue of $69.9bn, their 14% spend on R&D is worth $9.7bn. So, now we have given some context to the percentages, we’ve learnt that Google spend more than twice as much on R&D as Apple, but Microsoft spend near to double Google’s R&D spend. With revenues that exceed Microsoft and Google combined you could conclude that Apple are simply much more effective at and get a better return on R&D. Alternatively, you could conclude that Google and Microsoft have lagged behind Apple’s iDevices and iOS and are outspending in a game of catch up; you can observe a similar effect in Premier League football, where first Chelsea, then Man City have massively outspent their rivals in order to compete with, and beat, Man Utd and Arsenal (who had dominated the Premier League, winning 11 of 12 titles before Chelsea’s win in 2004-05). 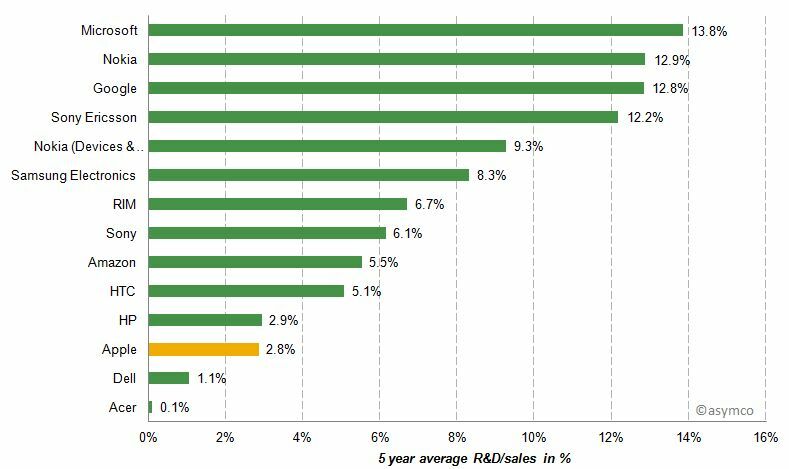 If you head to Gigoam you can see a chart of R&D spend as a percentage of revenue over 5 years. It turns out Nokia have spent 12.9% of revenue (with a second entry for devices showing a 9.3% spend). Well, if we take this chart without context, and follow Dan Lyon’s argument, they should be doing better and be more innovative than both Apple and Google. Yet it’s widely known that Nokia missed the smart-phone boat, and are something of a basket case; they’re betting their house on their alliance with Microsoft. Another superficial reading tells us it cost Samsung five percentage points more than Apple just to copy the iPhone. Now Samsung’s 8.3% of revenue might be considerably less in dollars than Apple’s spend. The trouble is without knowing the revenues of either Nokia or Samsung it’s impossible to make a meaningful judgement about the value of their R&D spend; and even then it may not reveal the true story, or even anything useful. The point I’m making is that percentages require context to give them any chance of providing meaningful, helpful and reliable information. But too often they’re used to deceive and mislead people. For example, across-the-board percentage pay rises are often trumpeted as being fair and equal for all workers. Yet, while a 5% increase on a salary of £50,000 is worth £2,500, the same 5% increase on a £20,000 salary is worth just £1,000. So the higher earner has a pay increase 2.5 times greater than the other employee. You can argue about whether this is fair, but it will never be equal. As designers we are often asked to visualise data, and percentages will occur frequently in the data sets. For the sake of the audience we should challenge to use of percentages without meaningful context, unless we wish to collude in misleading and deceiving people. Finally, if you have to buttress an argument with the misleading use of percentages, then your argument probably isn’t very strong to begin with.